The 3rdeyesociety blog is open. Salutations: My name is Grace an eclectic, solitaire, spiritual practitioner; president of www.houseofgrace.net, an esoteric new age shop, and soon to come our own line of 3rd eye products "3rd Eye Esoterics"; and founder of this blog page www.3rdeyesociety.blogspot.com, that serves as a vehicle for the purpose of connecting a society of psychic intuitives with one another. Feel free to share your knowledge of psychic experiences; and use of alchemy, magickal spells, and invocations for the transmutation of energies or altering of states. Our goal is to enable the end users to soul search creating a universal spiritual exchange. Easter traditions are a combination of a pagan holiday for the deity Eostre the Anglo-Saxon goddess of spring and the Christian rebirth of Christ, and it should always fall after Passover, and following the first full moon after the vernal equinox. It's a wonder how we are all spiritually connected. For you single people out there. Here is a simple herbal infusion spell to attract a mate and make you lucky at love: heat 1/2 gallon of water with 5 cinnamon sticks, then add 5 drops of your favorite perfume and 5 pink rose pedals, and the let herbal infusion mix seep until cool. Add the herbal infusion liquid to your bath water or cascade all over your body while showering, visualizing the partner that you want in your life, and say bring me once, bring me twice, bring me thrice the love I want. This simple attraction spell will make you the center of any party, so go out and have fun for true love awaits you..
Did you know that almost everyone is a 5 second clairvoyant (call it intuition or gut feeling) that can predict what is about to happen in the immediate future? However, like an athlete that trains for the Olympics some of us can improve this ability to fast forward and shift back and forth in time through the use of the pineal gland or the 3rd eye, hence, giving birth to the term psychic meaning the ability of a clairvoyant person to exchange souls with another person through telepathy as well as make predictions. So I invite you to join in by posting your comments and questions about any area of psychic phenomena, spirituality, and the use of alchemy (the transmutation of energy) that interest you to be shared in discussion. There are no right or wrong questions and answers when it comes to the development of the 3rd eye; everyone’s experiences are different and psychics all grow at their own pace. What we share here stays here, if you'd like to remain anonymous, that is the beauty of a blog. I decided to start this blog, because I want our hidden 3rd Eye Society to grow from one another without worrying who passes judgment. We can all learn so much more about psychic abilities if we share our experiences of this wondrous gift. Witchcraft also known as Alchemy (the transmutation of energy) can take sometimes minutes, hours, days, or years to manifest itself, but from my experiences the longer the spell takes to work, the greater the outcome will be revealed. It's as if the universe takes time to amplify the message and delivers an outcome in higher frequency back to the petitioner with unbelievable force, removing obstacles, revealing all doubts, and changing the course of things. Patience is a virtue even when it comes to practice of an Alchemist. from your mouth to gods ears...we all grow impatient sometimes but you always seem to send lovely words to ground us...thank you for just being you!!! Rage without direction has no purpose. During a full moon emotions will amplify, so if you enter the full moon in a bad mood that attitude will amplify, but if you entered it in a good mood it too will amplify. So try to enter a full moon in the best of mood, so that you can ride it on a positive wave. However if a bad mood is unavoidable try to neutralize your mood until the full moon cycle clears, to avoid any further discord. Learn to work with the moon changes, and you will be able to stay balanced during planetary changes that affect our moon cycle. "I trust the infinite intellegience of my subcounscious mind to reveal all that I need to know and do to make my dreams come true." This New Year make the universe a better place because you exist. 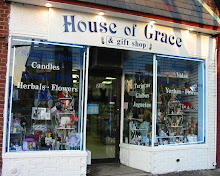 Start the year right by getting rid of the negative energy with La Madrina Spiritual Cleansing Bath available at House of Grace and Gift Shop 210 Willis Avenue, Mineola NY 11501, 516-747-1655. "A Simple Spell To Draw You Love"
Dearest Grace, such wisdom and clearness in your thoughts, in sharing you give yourself 10 fold. Grace is Awesome! I went to her store last year and she guided me into the area of good luck charms. I didn't have much money, she said not to worry. Let me tell you, GO to Grace if you want to better your life. Grace is the person to go to. I am very fortunate to have been able to meet this very nice woman. She is Awesome!! !